With the introduction of smartphones touting front-facing cameras, a slew of tools for video chatting found their way to mobile devices. If you are looking for a chat app to video stream and connect with users from the whole world to meet new and interesting people, we have the right app to offer you and make your search easier. We looked and we have to offer you an incredible chat app so you can video chat with others from all around the world. Let’s see what the app is about. Chatspin – Random Video Chat is developed on the iOS platform for all users that like video chat with strangers randomly from the whole world. Compatible with all your IOS devices, this chat app offers the chance to meet new people worldwide or from your surroundings with a tap on the app. The best video chat experience is offered to users with the HD streaming and crystal clear audio so you can find new friends, meet a love interest and get to know new interesting people that share your interests. This chat app has a connection with more than 1 billion people from all over the world and offers amazing features to enjoy when video chatting with strangers. Just by creating your profile without any complications, add your gender preferences and your location. Until you decide to give a name to the person you are chatting with, you are completely anonymous. Find a love interest, make friends and meet people that share your interests by connecting with users instantly. 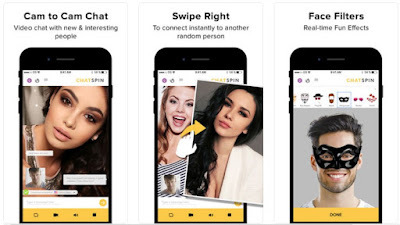 With swiping right you will be able to connect with a person of your choice. Real-time face filters are offered to users to enjoy the app even more and with over 30 custom filter effects to choose from you will have fun chatting with others. People of all ages, backgrounds, and nationalities can be found on the app to chat in a friendly and safe environment. Tap on the app to begin the video chat and use the pro-gender filters to choose with who you want to chat as well for the advanced filters to choose people that suit you the most. Download it on App Store for free and connect with thousands of random strangers to video chat!